Posted on June 21, 2017 at 1:39 am. Macau authorities are trying to crackdown on proxy betting after a $HK10 million illegal online gambling ring was uncovered last week. Last Thursday, Macau’s Judiciary Police arrested 17 people – 13 mainland Chinese nationals and four Macau residents – for allegedly operating an illegal proxy betting ring. The suspects have reportedly been filming VIP baccarat games in real time at a Cotai casino and broadcasting them using the messenger service, WeChat. The exact casino has not been specified. Players on the other end, who were not at the casino, would then make bets and watch the results via the live stream. As a result, Macau’s Gaming Inspection and Coordination Bureau (known by its Portuguese-language acronym DICJ) has demanded casino employees and junket operators monitor the 2016 ban of mobile devices at all gaming tables in the city. “DICJ has demanded of gaming concessionaires and promoters that – besides strictly complying with the casino tableside phone ban measure – they step up inspection efforts regarding the use of telecommunication equipment in other casino areas,” a statement released only in Chinese and Portuguese said. Many of the people arrested were caught in the VIP room with one seated at the baccarat table, while a number of others live streamed the game on smartphones. They were also betting for the customers who were on the other end of the live feed. The police confirmed they raided a residential property in the NAPE district and took communication devices, gambling chips totalling $HK1.7 million and a small amount of cash. Proxy betting gets its name from a person – known as a proxy – acting on behalf of customers who are outside the casino. It is considered to be another gambling platform. The controversial format is primarily catered to mainland Chinese nationals where gambling is illegal. This is despite the activity being prohibited in Macau – it is legal in the Philippines. The proxy betting group allegedly provided “two to three” betting sessions on a day to day basis and each session reportedly involved 40 to 50 gamblers. Not only is proxy betting banned in Macau, but the use of mobile devices at blackjack, baccarat and roulette tables in the city’s casinos is too. 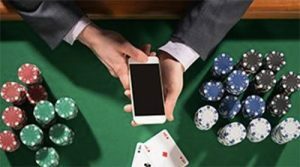 The mobile ban was enforced on May 9, 2016 – prior to the legislative change junket operators could use communication devices at casinos, provided the device had been pre-registered. After the ban was enforced, junkets and even players continued to use smartphones at the tables. According to Macau authorities, from May 9, 2016, to April 16, 2017, there was a total of 71 verbal warnings to casino patrons for violating the ban. Reportedly, around 49 of the incidents occurred this year. It is likely proxy bettors were among those warned to put their phones away, especially since a similar operation to last week’s illegal gambling ring was uncovered in April. Seven mainland Chinese nationals were arrested after allegedly providing a proxy betting service via WeChat. It is thought the men arranged bets via the social messaging service for VIP baccarat games at Macau casinos.